We don’t call Artifactory the Universal Repository Manager for nothing. You can now search for any package using search criteria specific to the package type. Looking for an image in your Docker registry? Specify its name, and/or its tag, or you can use its digest for a more specific search. Lost an Npm package? Search for it using its name, and/or version and/or scope. That’s how it goes for every package type. And if you’re not sure what exactly to put in a search field, you can even use wildcards (*, ?) and then review and filter the results to find the package you are looking for. Not only that. 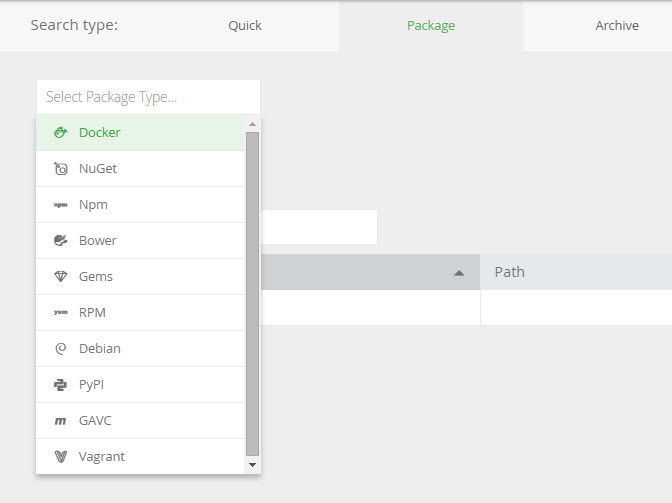 Since Artifactory knows what type of package you’re searching for and since, from V4.0, all repositories are single-package-type, Artifactory will only search through the relevant repositories, those with the specified package type, so the search is much quicker. And if you really want to get particular (i.e. you do have some idea where the packages you need are located), you can even specify which repositories Artifactory should search through. Naturally you can only select repositories that have the right type.